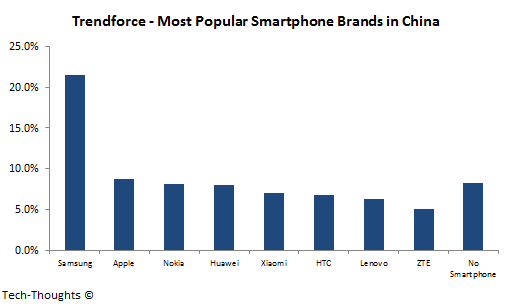 Trendforce's survey of Chinese smartphone owners showed that Xiaomi overtook HTC to become the country's fifth most used smartphone brand. Given their recent traction, this isn't much of a surprise. However, the popularity of Xiaomi's $130 "Red Rice" smartphone among existing smartphone owners is paints an interesting picture. 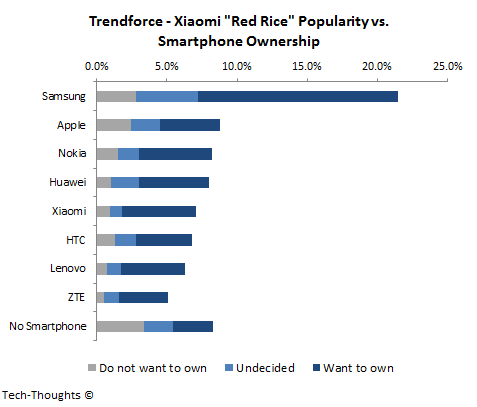 The chart below shows the split of consumers that are interesting in owning Xiaomi's "Red Rice" smartphone. While I'm wary of forecasting sales based on forward looking consumer surveys, it does give us a snapshot of Xiaomi's brand awareness, if not brand affinity. At first glance, the results seem to indicate that Samsung, Lenovo and ZTE are most likely to be threatened by Xiaomi's rise. However, there is wide variation in the ASP of smartphones sold by the vendors highlighted above. The fact that nearly 50% of Chinese iPhone owners are interested in the "Red Rice" smartphone should cause concern to all high-end smartphone vendors, especially given Xiaomi's international ambitions. Also, it is important to note that the survey only refers to Xiaomi's "Red Rice" model and not the MI3 flagship. Therefore, the actual desirability of Xiaomi's smartphones may be higher. The report also states that Xiaomi's "Red Rice" was most appealing to consumers concerned about internet connectivity, i.e. it appealed to users that considered a smartphone to be a mobile computing device, which is consistent with my data usage analysis. It was also least appealing to non-smartphone users despite its low $130 price. This suggests that any attempt to segment a market by price points or platforms is meaningless. Actual segmentation patterns are based on device usage, not price or platform.